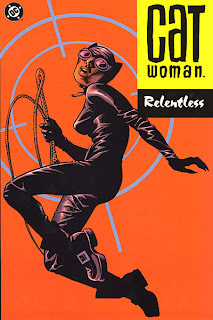 To be sure, Catwoman: Relentless is a good book. But anyone buying Relentless with the expectation that the content would resemble that of Crooked Little Town and Dark Side of the Street would be in for a shock. While there were certainly gunshots and dead bodies in the previous trades, Relentess raises the violence considerably, almost from the first few pages. Though much of the violence is suggested instead of shown, these still certainly aren't the comics I read as a kid. Relentless (separate from the other story collected in this trade, No Easy Way Down), is certainly moving, though it moves from triumph to tragedy so quickly that it's slightly difficult to appreciate (and therefore feel any emotion for) the new, good parts of Selina Kyle's life. Specifically, I think the strong hint that Sylvia Sinclair was up to no good took a lot out of the story; the reader never has any time to feel good for Selina, because we already know something bad is coming. But I do certainly give Ed Brubaker credit for the bad -- he took a lot of risks in this trade, showing the consequences of being a hero long before Identity Crisis did it, and I appreciate him for writing outside the box. What really takes this trade from good to great, however, is No Easy Way Down. No Easy Way Down is great for the art. It's great for the story. And it's great for whomever it was, writer or artist, who came up with telling the story in short, two page jumps, putting us deeply in all the characters' heads and making them just make sense. From Slam Bradley, whaling on a suspect for flirting with Selina, or Karon, the unsung hero of the tale, every little bit of No Easy Way Down just shined. And now I can't wait for Catwoman: Wild Ride, which promises still more character bits to come. The JSA ... by Jeph Loeb?! Geoff Johns to pen a JSA novel? Absolute Batman: Hush hint ... ?